Bernie Sanders is the best democratic candidate because he has the strongest policies and has consistently fought for them. Sanders’ track record is what makes people trust him and it’s the reason why he is so popular. Sanders says that he believes politicians should not be working for corporate interests so he does not take any corporate Political Action Committee money, nor does he take money directly from Wall Street or gas and oil executives like other candidates do. One of Sanders’ strongest stances is on environmental reform. He has consistently fought for lowering greenhouse gas emissions supporting legislation like the “gold standard” climate bill. He has opposed environmentally disastrous decisions like the building of the Keystone XL pipeline even when not many politicians did. Sanders is also one of the strongest supporters of the Green New Deal. The resolution aims for completely clean, renewable and zero-emission energy and upgrading infrastructure in an environmentally friendly way. Beto O’Rourke on the other hand, has talked about the dangers of fracking and the need for environmental reform.However, he has supported Republican legislation that is harmful to the environment. For example, he voted twice to lift a forty-year-old ban on oil export. O’Rourke has also voted against legislation that would prevent drilling in the Gulf of Mexico which could also have devastating consequences, like oil spills. This makes O’Rourke a weak candidate on the issue of environmental reform. O’Rourke once made a pledge to not take money from the fossil fuel industry and he broke it. During his senate campaign, he took $430 million from the oil industry. Seventy-five percent of donations came in the form of large donations, over $200 with a cap of $2,700, and over two dozen donors were gas and oil executives. His voting pattern is not surprising, and indicative of O’Rourke’s friendship with the oil industry. No one has been as strong as Sanders on Medicare for all. He introduced The American Health Security Act of 2013, a bill that aimed to provide universal health care, and is releasing an updated Medicare for all bill. He does not support a system where private insurers control the market. Around $30 million people are uninsured. Many people get into massive debts from expensive medical bills and some even die from lack of healthcare. Other candidates, like Elizabeth Warren and O’Rourke, have also supported Medicare for all. However, both of them have changed their language on the issue suggesting they would not fight for it. For example, Warren has said that she also likes the idea of expanding Medicaid. That is not Medicare for all. It’s important to note that despite Warren’s long time fight against big money in politics, she has stated she will take corporate PAC money if she won the nomination and ran in the general election. This is a red flag considering those who take corporate PAC money are known to work for their donors rather than their constituents when voting on legislation. O’Rourke has recently said on CBS News that Medicare for all is one of the possible paths for expanding coverage. This is different from his earlier position that Medicare for all was the best path. O’Rourke also has a bad record of voting with Republicans to undermine healthcare. For example, he voted twice with Republicans to impede an independent payment advisory board from helping reduce Affordable Care Act spending without rationing, raising premiums, reducing benefits or restricting eligibility. Another democratic candidate weak on the issue of healthcare is Cory Booker, who voted against Sanders’ amendment on a bill that would allow for the federal government to purchase drugs from Canada where they are much cheaper. These big banks often make shady investments that cost the American people trillions of dollars in bailouts, like in the 2008 financial crisis when the criminal banks needed the money to be saved. Sanders also supports a tax on Wall Street speculation and would use the money to pay for things like free college, Medicare for all and other policies. The Tax Policy Center says that this form of tax could help earn $50 billion per year. 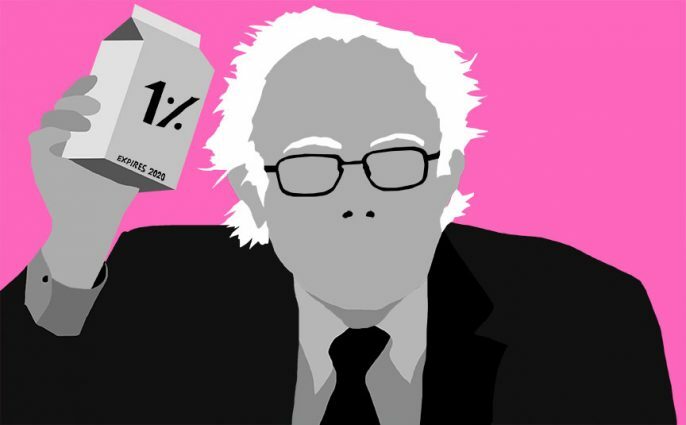 Sanders’ Inclusive Prosperity Act of 2015 aimed to impose that tax. Meanwhile, O’Rourke voted in 2014 and 2018 to weaken the Volcker Rule, which prevents financial firms from using depositors’ savings for speculative trading. He has also voted several other times to deregulate Wall Street, including a package of Republican bills last year that would deregulate stock exchanges and high-frequency trading. This might be the reason why a Wall Street-funded group like Third Way has praised O’Rourke. Kamala Harris is possibly the worst offender for protecting Wall Street. As attorney general, she failed to prosecute OneWest Bank, then chaired by Trump’s Treasury Secretary Steven Mnuchin, despite Harris’s investigators finding widespread misconduct in state foreclosure cases from the national mortgage crisis. While some of Sanders’ competitors may be good on some issues, they have major problems when it comes to key issues.